Grew Up... in New York City’s Hell’s Kitchen in the 1970s with a caring mother and an abusive father. Wilson’s dad Bill taught his son that the only way to deal with bullies is to keep hitting them back. When he was 12, Wilson’s mother sent him away to live on a farm in the middle of nowhere. Profession... criminal entrepreneur. Although Fisk bills himself as a businessman, his work involves less than legal means. He conducts most of it from the shadows, preferring to keep his identity a secret and speak through his loyal assistant James Wesley. Fisk’s elite business associates include international crime lords from Russia, Japan, and China. Interests... the finer things in life: the best restaurants, most expensive wines, his immaculate penthouse, and a painting called “Rabbit in a Snowstorm.” Although his father was abusive, Fisk also strives to honor the good parts of his father’s legacy by wearing his cufflinks each day. Relationship Status... courting Vanessa Marianna, an elegant art dealer and one of the few people who truly intimidates Fisk. Personality... soft-spoken, shy, insecure, sophisticated, haunted by the past, and full of barely contained rage. Fisk is a creature of habit – he makes the same perfectly prepared breakfast every morning. He’s nervous and shy around women and he often comes across as a gentle giant. But when someone gets on his bad side, something in Fisk snaps and he lashes out in violent, deadly outbursts. 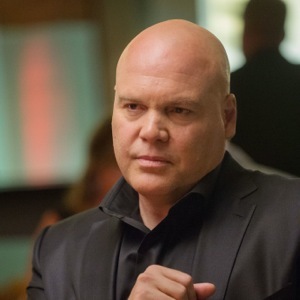 Wilson Fisk's popularity ranking on CharacTour is #354 out of 5,000+ characters. See our top-ranked characters and read their profiles.